The flag is a blue fieldwith a horizontal yellow stripe slightly below the midline and two white,five-pointed stars in the canton. The blue symbolizes the sea and sky (the bottomand top blue sections, respectively) divided by a yellow stroke representingthe bright sun which bathes the island. The two stars represent Curacao andKlein Curacao, but also 'Love and Happiness. 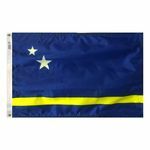 The five points on each star symbolizethe five continents from which Curacao?? ?s people come.